This remarkable loft for two persons is situated in the heart of Ghent and has panoramic views over the Lys. Furnished with designer furniture, such as chairs by Kartell. Ideal location and beautiful view! The two biggest advantages of this apartment is undoubtedly the unique views and an ideal location, since everything in town is within walking distance. Near the Coulter, one of the largest squares in Ghent. Within walking distance of the Ghent St. Pieters, plus easily accessible by tram with a stop at the door. There is also an underground car park on site, just below the building. Unique in the center of Ghent: no expensive parking fees! View more about Glynis P.
Gute Größe für zwei Personen. Leistungen wie besprochen, Service ausgezeichnet. Vor der Tür befindet sich aktuell eine große Baustelle, die uns am Wochenende jedoch nicht gestört hat. We have just spent a wonderful weekend in this great flat. Especially the view was incredible but also the beautifully designed flat. It contained everything we needed. Gent ´s sights were just a short walk away and we were glad that we could park our car so safely . St Baaf´s cathedral has a whole wealth of paintings and we liked the audio tour of the" Lamb of God". ( Only for 4€) We also can recommend the exhibition "History and film" at st Pieter´s Abbey which gave us an overview of many well known English films its original costumes. Also the little "Begijnhof " is recommendable with its quiet atmosphere almost in the middle of Gent. 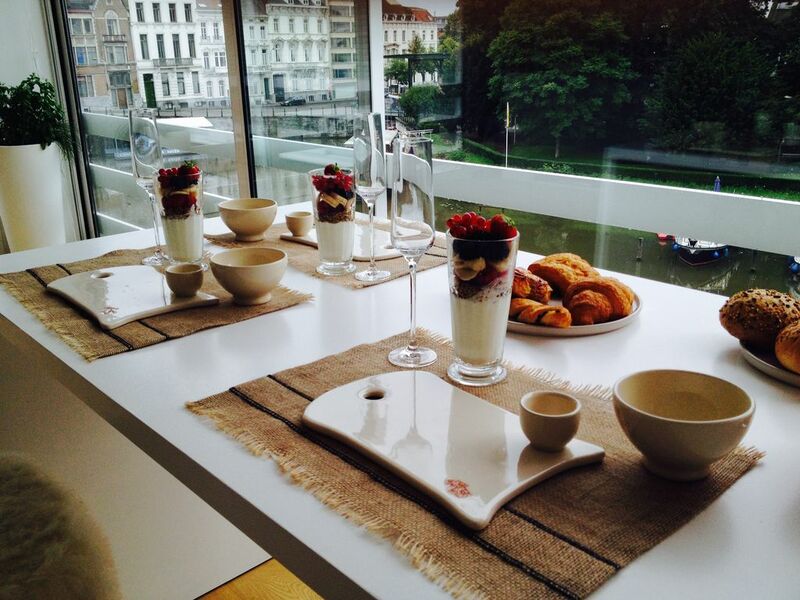 Everything in the flat was clean and tidy and we enjoyed having our breakfast with thegreat view to the Leie . The bed was very comfortable and cosy. Although it rained a lot at the weekend we did not mind because we had space enough in the appartment. There was a vegetarian restaurant round the corner which served delicious food. ( Green Way) and a lot of other restaurants and pubs, too. And a Spar supermarket is a 3 minutes walk from the flat. We highly recommend this appartment. For older people than us ( we are in our fifties) it might be a problem to get off the seats / cushions in the living-room part. Thank you Glynis for offering this stylish flat to others! mooie voorstelling in De Expeditie gezien, Poeziecentrum zeer interessant voor taalliefhebbers. Bezoeken aan STAM, SMAK en Zebrastraat zeker aan te bevelen. What a delightful city and a wonderful apartment to spend our time in. Myself and my partner booked 6 nights with Glynis and enjoyed our stay in mid November last year. Firstly, booking with Glynis was very simple and she made it as easy as possible for us at every turn. Even when we had passport issues and it looked like a holiday might not have been possible she was accommodating and polite throughout the whole booking process. She enlists the help of her lovely mother too and this kind of customer service is something you just don't seem to get when booking with a hotel. It was personal and kind from first to last. Secondly, I must talk about the apartment and what a brilliant space it is. There's a fully equipped kitchen, excellent shower room and separate toilet. The bedroom is in the living space adjacent the kitchen. Don't be put off by this, there's still plenty of room between all the component parts. It's all stylishly furnished too and not at all cluttered. The best part, of course, is the view from the windows; almost panoramic, it looks out onto the river and the street behind it. Eating your breakfast or enjoying a beer whilst taking in the view is stunning. Especially if the sun is shining! Next, the city itself. What a great place! I must confess, we primarily came for the beer but there is so much more to see besides. I won't go into detail. You'll just need a decent guidebook or your own two feet to explore and explore with success! On the beer and bar notes, the Kapitein Cravate is right in front of you when leaving the apartment; it's a great little student bar with 20 or so beers on the list and a good line in gin and tonic too. If you're into beer I highly recommend CAMRAs Good Beer Guide To Belgium. And a handy print out from Podge (search online for him) is a must! The beer choice in this city is some of the best of anywhere I've ever experienced and the true depth and breadth of bars and restaurants in Gent is incredible. All in all, a fantastic holiday from first to last. I'm only sorry it took us so long to get round to writing this review! Thanks for a great time Glynis, one day we hope to be back. Hi Craig and Josie! I want to thank you for your lovely words! I am so glad that everything with the passport worked out and you were able to travel anyhow! Super to hear you had a great time, and I hope to welcome you back any time soon! Thanks for taking such good care of the apartment! All the best in life! Parto col dire che Gand è una cittadina meravigliosa, una sorpresa inaspettata in questo nostro viaggio alla scoperta del Belgio, mi permetto di consigliare questa meta se anche voi come me,amate l'atmosfera delle fiandre.Qui potrete trovare tutte le caratteristiche tipiche di questa regione. Canali con scorci romanticissimi, ristorantini che affollano le piazze, monumenti suggestivi, ma anche vie dello shopping e pub con la migliore birra che abbiate mai bevuto. Detto questo, ma vi garantisco che ho detto davvero poco, vi chiedo, qual'è la cosa che garantisce ad una vacanza la giusta comodità e tranquillità? Un buon alloggio e per chi preferisce una casa ad un hotel, posso dire che questa casa è l'ideale. Ho soggiornato qui per una settimana. Il centro è a due passi e si raggiunge comodamente dalla via dello shopping, oppure con il tram,il numero 1 o il 22 che passano molto frequentemente e che si fermano a pochi metri da casa e con gli stessi mezzi si può raggiungere la stazione che collega Ghent a tutti i principali paesi da visitare, Bruges,Bruxelles,Anversa e molti altri. Il quartiere è tranquillo e si può passeggiare senza problemi anche di sera. A pochi passi da casa c'è anche il supermercato. La casa è pulitissima,moderna e romantica, i proprietari disponibili e gentilissimi, e mettono a disposizione tutto quello che c'è in casa. Una casa che è perfetta come si vede in foto, ha la tellevisione, il forno, la lavastoviglie, tutto ciò che serve per cucinare e addirittura riviste e libri. Troverete a vostra disposizione anche la guida di Gand e la cartina,in inglese francese e tedesco,non ricordo se anche in spagnolo. Io e il mio ragazzo siamo rimasti molto contenti di questa sistemazione e siamo andati via con un pò di tristezza nel cuore, quella tipica malinconia che si ha quando in un posto sei stato davvero bene. Grazie mille per il vostro soggiorno! And for writing this lovely words about my apartment!